I've mentioned the difficulties that kids with hyperlexia have with "WH" questions numerous times. So we have to practice, practice, practice answering and asking "WH" questions in an attempt to build language and comprehension. I've already shared some all about me questions and prompts and they have worked great with our son. I have created a new set of questions and prompts all about everyday objects like cups, utensils, soap, shampoo, telephones, chairs, and more. There's 50 questions and prompts in all and they're all free to download. My son with hyperlexia can easily answer a prompt when phrased as a sentence that he has to complete, but if I phrase the same prompt as a "WH" question, he struggles. That's why it is so important for us to practice these types of questions over and over. Cut them all out and match the question with the appropriate answer. Have your child ask the question and you respond. You ask the question and the child responds. Keep the question and answer prompt attached (i.e., don't cut the cards vertically) so that you can fold the answer behind the question. Then your child can read the question, try to answer it, and then double check by folding it open to see the answer prompt. Read the prompts only and see what creative answers your child may come up with. For instance, the prompt, "I have a bath..." could be answered as "I have a bath every night before bed" or "I have a bath when I am dirty." 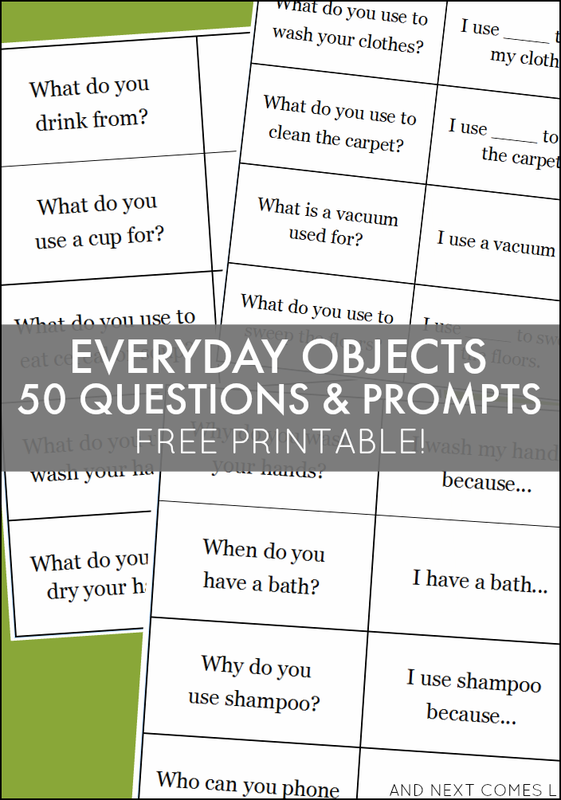 Want more free printable questions and prompts? Grab these 30 all about me questions and prompts too. Hi Dyan, like you i am a mom too and have started a centre for children with High functioning Autism. I help parents take their children to increasing levels of academic abilities. i am struggling with a hyperlexic child who is quick to learn and very bright but poor in inferencing. I do some similar things as you have mentioned.But the free cards will be very helpful and already my head is buzzing with ideas! Thank you so much! God Bless You! You're welcome, Seema! Be sure to check out all of the other speech printables that I have since they're all geared towards hyperlexic kids.